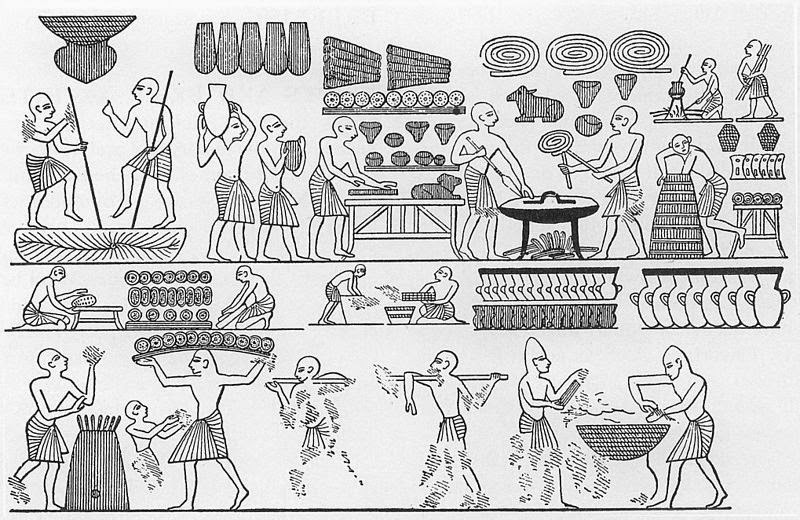 The Historical Cooking Project is pleased to publish a second piece by Conor Heffernan about the early protein supplement Plasmon and its associated cookbook. For more of Heffernan's work, see his post on Bernarr MacFadden's Physical Culture Cookbook. From smoothies and breads to our favorite cereals and chocolate bars, protein enhanced foods have grown exponentially in popularity over the past decade and a half. Once the preserve solely of the gym goer, protein powders and protein foods have, according to a 2017 article in The New York Times, become a mainstay in popular culture. The purpose of this post is not to highlight this new trend, as interesting as this may be, but rather to examine a century old precursor to the modern protein obsession. Brought to England in the late nineteenth and early twentieth-century, ‘Plasmon’ has been cited by several scholars as the first recognizable protein powder supplement of the modern age. Odorless, tasteless and bland in appearance, Plasmon was marketed as a health enhancing, muscle building and lifesaving substance. Advantageously for the firm, health was vaguely defined in Plasmon’s advertising. Thus, in some instances it referred to building muscle and in other cases the treatment of disease. The diversity of its applications was matched by those endorsing it. Its advocates could be found both in respected medical journals such as The Lancet and British Medical Journal, as well as the vaudeville stage with several physical culturists such as Eugen Sandow, pictured below, proving ardent supporters of the substance. Photograph of Eugen Sandow from the mid-1890s. (London: Gale & Polden, 1897), 115. 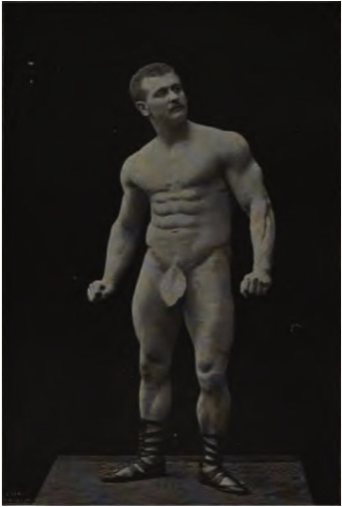 Physical culturists like Sandow, have been seen by many as precursors to the bodybuilders and fitness models of the today. Famed primarily for their strength or muscularity, physical culturists who endorsed Plasmon, such as Sandow, Eustace Miles or C.B. Fry served as literal models for the types of bodies Plasmon could produce. 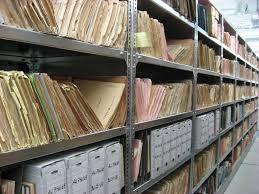 The complimented the reports from respected physicians that Plasmon would build nerve and sinew in equal measure and were the seen as trusted health advisors given their own prowess. For Plasmon or Dr. Virchow, one of the eminent physicians associated with the product, just one serving of Plasmon added to one’s meal would provide a great boost to their health. As previously demonstrated by Steinitz’s work on the subject, Plasmon, alongside several other nutritional substances of dubious quality, was promoted to mothers, office workers and athletes through a range of different promotions. What these promotions shared in common was the idea that one could enhance the nutritional content of their food and thereby improve their health, with the addition of Plasmon. 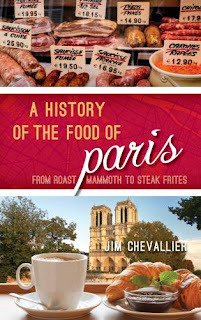 The object of today’s post, the Plasmon Cookbook, was born from this claim. Owing to the British public’s suspicion and unfamiliarity of Plasmon in the early 1900s, a series of promotional campaigns were set in motion during this period to familiarize Englishmen and women with the bland protein powder known as Plasmon. Composed of casein derived from the processing of milk, Plasmon’s greatest advantage was that it could be added to foods without altering the taste. This, as Plasmon’s marketers astutely noted, meant that the supplement could be added to traditional recipes in the home without spoiling one’s dinner. 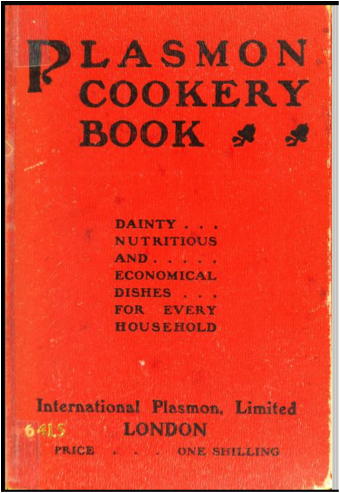 This insight provided the impetus for the Plasmon Cooking Competition of 1902/1903 and the subsequent cookbook which emerged from it. Advertising initially for the best mashed potato recipe using Plasmon, the competitions would soon be open to all recipes which contained the milk-based substance. 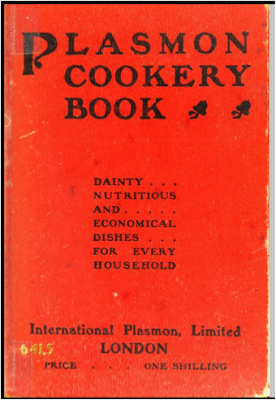 Once the competition ended, the firm’s favorite recipes were collected and published to form the Plasmon cookbook, available to the public in 1904. Echoing the competition’s emphasis on traditional English recipes, the cookbook focused on soups, breads and chowders rather than exotic or expensive combinations. As is clear from the below two recipes, a dash of Plasmon was all that was needed to turn a dish from regular fare into a superfood combination. Plasmon Steak and Kidney Pudding. · Put the flour, Plasmon, and salt in a basin, add the suet (finely chopped), and mix all with cold water into a stiff dough. · Line the basin with half the paste; cut the steak and kidney in nice pieces, season to taste, and put in basin till nearly full, adding a little water for gravy. · Then cover over with remainder of the dough, join the edges round the basin, and trim off neatly. Wring your pudding-cloth out in boiling water, tie it over the basin, allowing room for the dough to swell. · Put the pudding in a saucepan of boiling water, and boil 2 hours. · Pour out the water, leave to cool and then serve. 4 os. Breadcrumbs; 1 oz. Plasmon; 4 oz. marmalade; 4 oz. castor sugar; 4 oz. suet; 3 eggs. · Put into a buttered basin, cover down with a cloth, and boil for 2 hours. This dish may be garnished blaying raisins or sultanas evenly round the buttered bowl before pouring in the mixture. · When cooked, turn out carefully, and sprinkle with castor sugar. Serve with Plasmon sweet sauce. While Plasmon’s shelf life in England proved to be rather short-lived, the product effectively vanished prior to the Great War, its legacy proved much longer lasting. Plasmon’s claim that one could add additional protein and nutrients to one’s food through the simple addition of a protein powder has not only endured but flourished in the past decade. Whereas those concerned with their health in 1901 were likely to add Plasmon to their soup or sweet dish, modern consumers can collect a protein bar or drink with ease. The substances may have changed but the philosophy remains. Sophie Egan, ‘How Much Protein Do We Need?’, The New York Times, 28 July, 2017. Available at https://www.nytimes.com/2017/07/28/well/eat/how-much-protein-do-we-need.html. Ina Zweiniger-Bargielowska, Managing the Body: Beauty, Health and Fitness in Britain, 1880–1939 (Oxford: Oxford University Press, 2010), 1-12; Michael Anton Budd, The Sculpture Machine: Physical Culture and Body Politics in the Age of Empire (London: Palgrave Macmillan, 1997), 1-22. Plasmon Ltd., Plasmon: The Mainstay of Life – What is It? (London: International Plasmon Ltd., c. 1906), 5-6. Lesley Steinitz, ‘The Language of Advertising: Fashioning Health Food Consumers at the Fin de Siècle’, in Food, Drink, and the Written Word in Britain, 1820–1945, eds. Mary Addyman, ‎Laura Wood, ‎Christopher Yiannitsaros (London: Routledge, 2017), 135-163. ‘Mashed Potatoes: £20 in Prizes’, Eastern Daily Press, 20 November 1903, 7.
 International Plasmon Ltd., Plasmon Cookery Book (London, International Plasmon Ltd., c. 1904), 26.